Hunting season is striking early at Pirate's Place Farm. For the last twenty years, hunting season has meant Trespassing and Poaching season on my property. It's not even official hunting season yet and a ten point buck has already been poached and my friend and his grandson have been unpleasantly confronted in my woods. I've spent the afternoon on the phone trying to find the supervisor of the man who yelled at them. He claims to be a conservation officer but none of the supervisors will claim him because he doesn't wear a uniform. 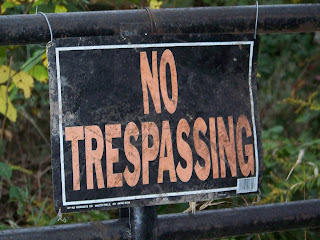 His conversation with my friend proved he is the trespasser who has been causing me a lot of grief for the last couple months - leaving my road gate open, leaving barn doors open, leaving barn lights on - all of those things that leave a message that someone without permission has been there. The story is that Mr Gooding, whose property is next to mine, called this morning because there was a strange truck parked in his driveway early this morning. He apparently foolishly gave some men permission to take "nature walks" in his woods - and it turned out they are really poachers. Allegedly Jason Smith responded to the call and caught two men with a ten point buck, but one of the men escaped and ran across my property. So, just like the trespasser/poachers who always say they are only on my property because they wounded a deer and it ran onto my property, Jason Smith ran onto my property and confronted my friend and his grandson. No escaped poacher seemed to be anywhere around. What he did today was annoying, but add up what he's been doing to me for weeks and I think it's criminal. Someday with all of the crazies who illegally hunt in woods there is going to be a terrible accident. The area just isn't big enough for a bunch of armed men to shoot at everything that moves and never hit each other, and, at the moment, I wouldn't feel bad if the man who has been scaring me for weeks was an accidental target.